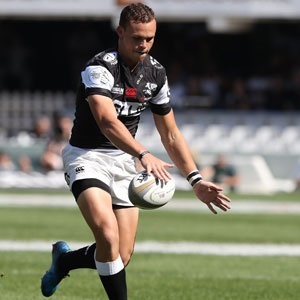 Durban - After making his Springbok debut against Argentina in Port Elizabeth back in August, Curwin Bosch has been putting in some big performances far away from the spotlight that continuously hovers over the national side. Not picked for any of the remaining Rugby Championship fixtures home and away to Australia and New Zealand, Bosch returned to the Sharks where he has been spearheading their bid for a first Currie Cup title since 2013. Still just 20-years-old, Bosch has been instrumental to the Sharks' cause in the tournament. His kicking game, in particular, has been impressive while he has also been lauded for his game management and temperament. With a bright Bok future ahead of him, Bosch can make a serious statement by guiding the Sharks to Currie Cup glory this weekend. "Curwin definitely has the temperament," Sharks assistant Shaun Everitt told media in Durban on Monday. "The drop goal in the second half (in the semi-final against the Blue Bulls) was a good example of that. We were under the cosh and only up by four points, so he gave us that seven point cushion. "He's come on really well. We're really pleased with the way that he's improved his attacking play. He's always had a good kicking game, but his attack has improved a lot. He's taking the gain line on and he is a threat for the defence when he has ball in hand." Everitt added that Bosch, who has kicked four drop goals in the tournament already, would be practicing that skill this week in preparation for the final. Turning his attention to Western Province, the Sharks' opposition for Saturday, Everitt said his side would draw on the clash between the sides at Kings Park two weekends ago. The Sharks ended up losing that match as WP put on a dominant second half display, but Everitt says they can still take heart from aspects of that performance. "They've improved over the season," Everitt said of the Capetonians. "At one stage they were out of the playoffs and they've worked hard to get into second place. "They put in a determined performance against the Lions (semi-final), but we can't forget what happened at the start of that game at Kings Park. We were on top of them for 30 minutes so we'll take the positives out of that." Kick-off on Saturday in Durban is at 16:00.